Simon Shaheen has dazzled listeners worldwide, as he deftly leaps from traditional Arabic sounds to jazz and Western classical styles. His soaring technique, melodic ingenuity, and unparalleled grace have earned him international acclaim as a virtuoso on the ‘oud and violin. For the past six years, Shaheen has focused much of his energies on Qantara. The band, whose name means arch in Arabic, brings to life Shaheen’s vision for the unbridled fusion of Arab, jazz, Western classical, and Latin American music. His concert credits are a veritable compendium of the world’s greatest venues: Carnegie Hall, Kennedy Center, Cairo’s Opera House, Theatre de la Ville in Beirut, and Belgium’s Le Palais des Arts. His full bio can be seen here. 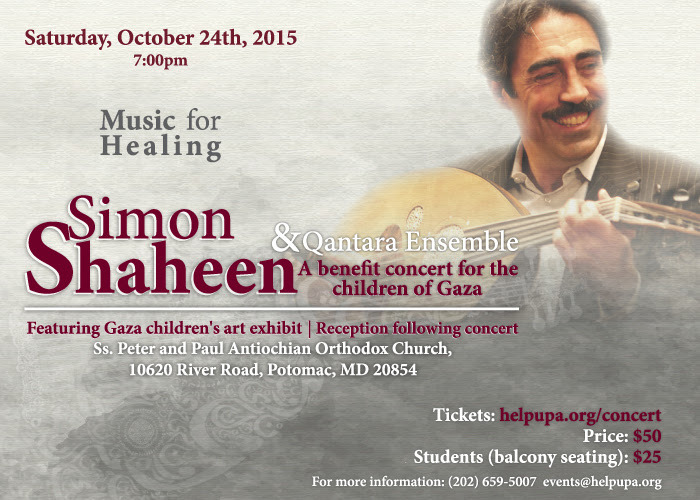 Proceeds from all ticket sales will benefit the Healing Through Feeling program. UPA has long been committed to supporting the physical well-being of children in Gaza. The UPA Healing Through Feeling program focuses on supporting the emotional well-being of children in Gaza traumatized by war and subsequent living conditions. The program was developed by a team of professionals in child development and trauma in collaboration with colleagues in Gaza. We believe that awareness-building is a crucial step to healing and will begin the process for these children to grow, succeed and thrive. Join us in helping more of Gaza’s children get on the path towards their own bright future!